There’s nothing like the rush of marching a show you created and then strutting off the field to the compliments of audience members. 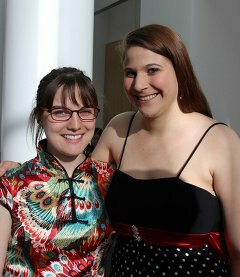 Having been Show Committee Chair for two years, I really learned to cherish those moments. This year we performed an Evolution of Rock Show, a Les Miserables Show, a Flight Show, and a Stevie Wonder Show. It was my final marching band season and my favorite by far! About five years ago, the band drill began to change drastically from the days of picture drill. We now write drill that focuses mainly on movement and geometrically interesting formations. 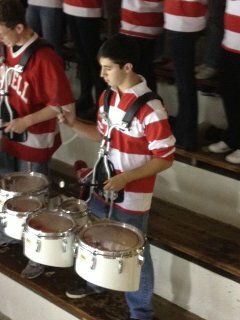 Last year, Nick “Inky” Lamson ’14 and I started to push the band a little more with some harder drill and despite the expected objections, all the shows looked great. This past season, Corey Chang ’15 and I chose even harder music and even more difficult drill. However, the band continued to rise to the challenge, and the shows looked even better than last year’s. Last year when we were writing our first show, the Latin Show, we found drill from when the band had performed Encantada many years ago. One of the sets was the shape of a chili pepper, and the idea of making a shape like this seemed completely foreign to us. We instead chose to go with an interesting geometric shape to start the show, and it turned out really well. Since then, I’ve known that avoiding picture drill is always the right way to go. I’m extremely grateful to those ShowComm Chairs of the past five years for blazing this trail for me and for future Show Committee Chairs. I’m also very thankful to have been able to hold this position for two years, and even when band members gave me grief, I always found it extremely rewarding to see the band put on a great show that I created. The Big Red Band rocking it at the Hahvahd home game! 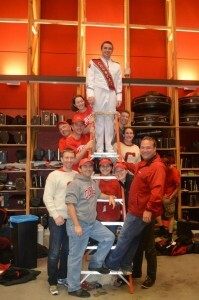 Around the Band: Section Shenanigans! The character of the band would be nothing without the individuality and quirkiness of each section. Here is a brief update on what happened this year within each section. Recent alumni: see how your friends are doing. 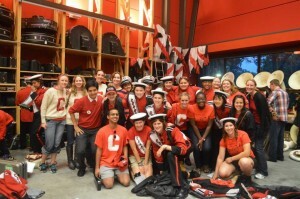 Older alumni: check out where your section is now! 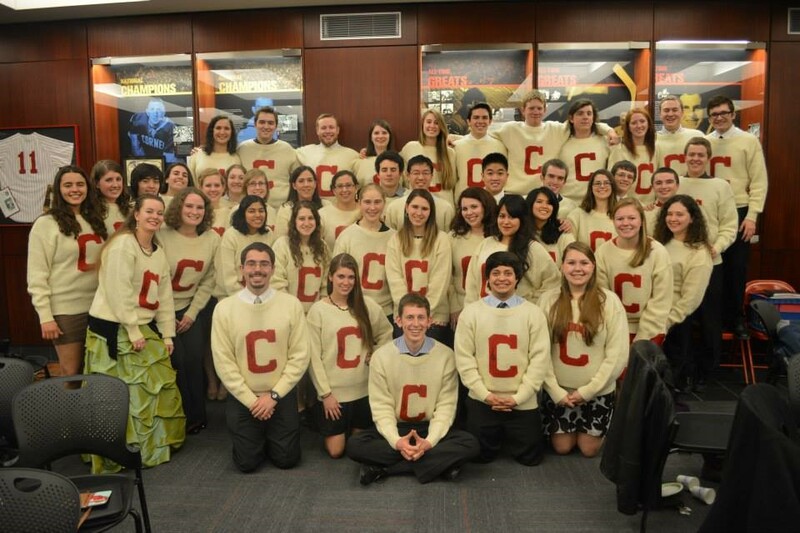 Life beyond Cayuga’s Waters…Alumni Beat 2014! A small glimpse of how Cornell Bandies are making their mark on the world after graduating from the hill. 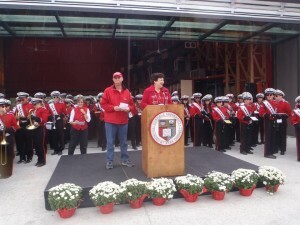 The Fischells speaking at the Dedication Ceremony of the Fischell Band Center, Fall 2013. Just Got Hitched: Tom Pasniewski ’98 married Katie Dankleff on June 8, 2013 on a farm just outside Lincoln, Nebraska near her hometown. A graduate of the University of Nebraska and a lifelong fan of Nebraska’s “Big Red,” Katie found the transition to rooting for Cornell to be an easy one and shares Tom’s interest in Cornell athletics. After spending the last 15 years entrenched in the Cornell alumni scene around Boston, Tom relocated with Katie to Lawrence, Kansas in the summer of 2013 to be closer to Katie’s family. 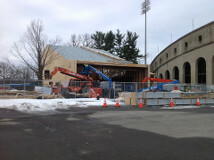 Tom will miss the ease of attending Cornell athletic and other alumni events that life on the east coast afforded. 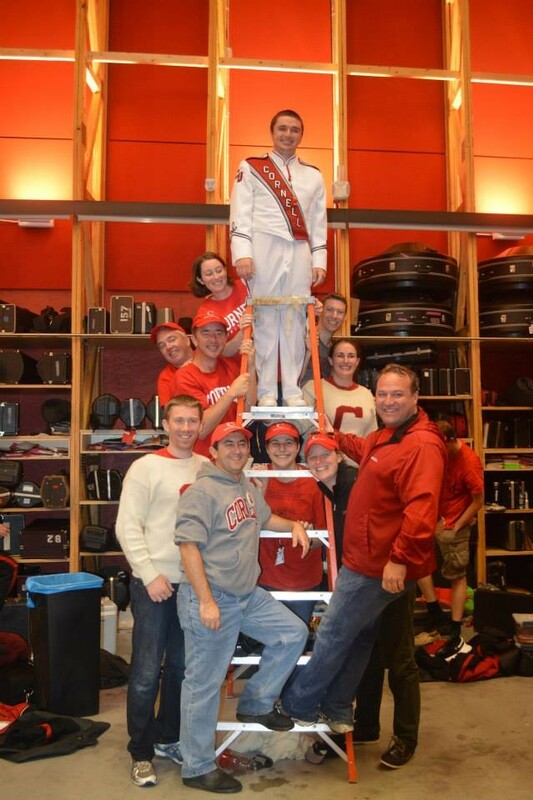 Big Red Drum Majors, past and present, pose on the ladder during Homecoming, Fall 2013. BRMB – The Next Generation: The classes of the ‘90s are creating the next generation of Big Red Bandies. Johnny Chan ’97 welcomed son Ryan Desmond on February 15. Ryan joins big brother Julian in the Chan clan. Meantime, also on February 15, Kevin Wise ’94 welcomed another daughter, Allison Rose, making Emilie a big sister. Many congratulations to our Band Alumni and all the best for the future! We always love hearing from our Big Red Marching Band Family so please don’t hesitate to share any news from your lives (marriage, kids, new job, dream house, etc.) with us. The outgoing Class of 2014 and our incoming bunch of new band alumni at Nonsectarian, Fall 2013. The following article featuring BRBAA appeared in the September/October 2013 edition of the Cornell Alumni Magazine in the Alma Matters department. 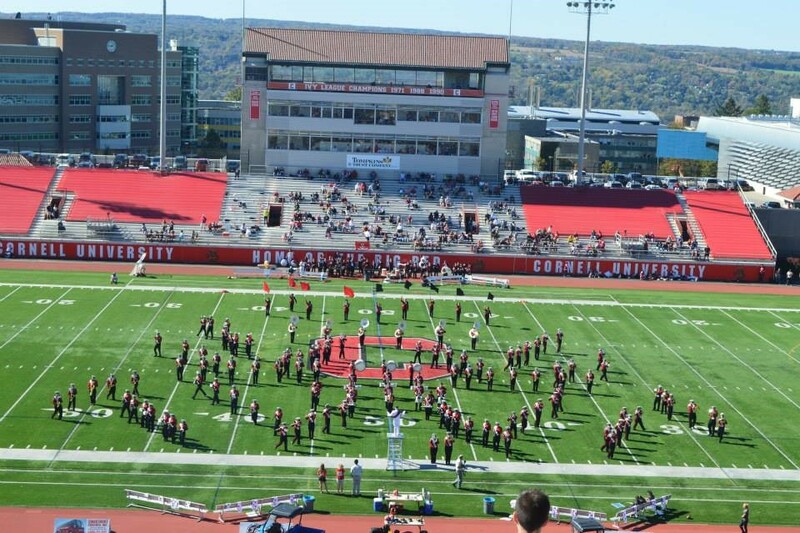 At Homecoming, alumni of the Big Red Marching Band and Big Red Pep Band will gather for a big celebration: the dedication of a new practice facility behind Schoellkopf Crescent on Kite Hill. It was launched with a lead gift from former members David Fischell ’75, PhD ’80, and Sarah Thole Fischell ’78, MEN ’79, whose children were also in the band. The new facility will offer more practice and storage space—and move the bands out of their home of more than fifty years, a cramped room in Barton Hall. Beautiful music: Band alumni got their first look at the new Kite Hill practice facility during Reunion, when they played together (left) and perused some vintage photo albums (right). However, BRBAA knew that phonathons would cover only annual operating expenses and not long-term needs such as instrument and uniform replenishment. So in the mid-Eighties, it created an endowment fund. Chaired by Vicks, the successful campaign was launched with a 1989 Carnegie Hall concert celebrating the retirement of the band’s longtime music advisor, Marice Stith. 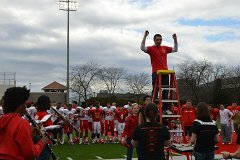 The Big Red Bands facility dedication is set for 11:30 a.m. on the Saturday of Homecoming. The band is inviting alumni to join them to play Carry On Wayward Son during the Homecoming halftime show. Use the links below to download and print your part ahead of time and save some time on the morning of the game. Note that the piece will start with an 8-bar intro by the trumpets and percussion before the beginning of the piece. Thank you to all who joined us for Reunion! We’d like to thank all who ventured to Ithaca for Reunion Weekend! 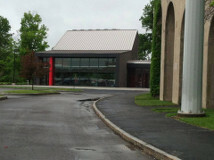 It was great to meet so many of you, and give you a sneak preview of the new Big Red Bands building. We hope to see even more of you during Homecoming Weekend, which will be September 20-21 this year. Please see our Homecoming update for important information regarding hotels and the schedule of events for game day, including the grand opening of our new facility. 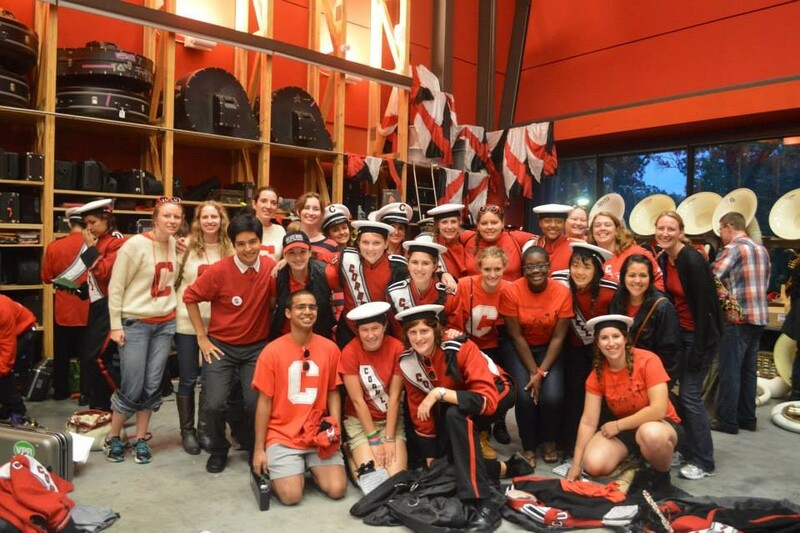 Join the Big Red Band for Homecoming 2013, September 20-21! Come join friends old and new during this year’s Homecoming Weekend! This Homecoming is more special than ever as we officially unveil the new Big Red Bands facility. 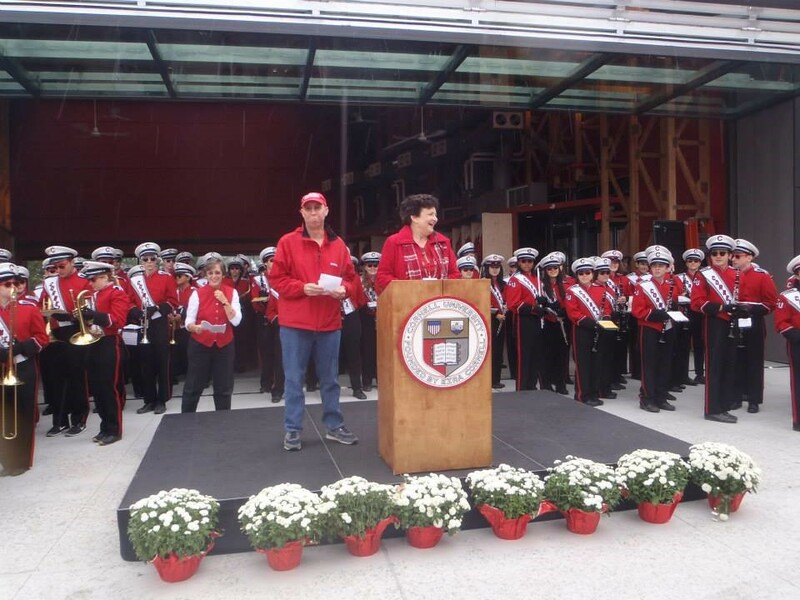 As a cooperative effort of the Cornell community and the Big Red Band’s large alumni network, this state-of the art, LEEDS approved building will be in full operation for our Homecoming festivities. 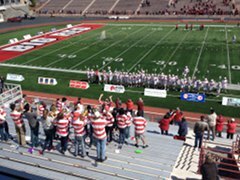 The Big Red Bands Alumni Association has reserved blocks at several local hotels. These rooms are going fast, so book now! We look forward to meeting you during Homecoming!